Throughout the eighteenth and nineteenth century in Britain there was a decided trend in painting that sought to record the world in all its details[i]. While the eighteenth century saw explicit recording of the areas surrounding England in Whales and Scotland, by the nineteenth century this fashion had moved onward to the continent, middle east, and even reaching China and India. However this desire did not take into account the continually changing people who would document these lands. In the peculiar case of Sir David Wilkie, R.A. and his young admirer John Frederick Lewis, R.A. their mutual humble beginnings, Wilkie’s Scottish heritage and the Lewis’s high regard for the older painter would change these aims, complicating and undermining the intended results. In 1840 Sir David Wilkie, planning to begin work on a series of historically accurate scriptural paintings in the Holy Lands, found himself stalled in Constantinople. The aggressive moves of the Pasha of Egypt, Mehemet Ali to break free of the Ottoman Empire and establish a hereditary title had incurred the military response of Britain, Austria, and Turkey, effectively closing the area to travel. While he sojourned against his wishes, Wilkie busied himself with a series of local portraits. Upon hearing that Wilkie was in Constantinople, John Frederick Lewis, who had long emulated the older artist abruptly ended his three-year tour of the continent, where he had recently finished his drawing of Two Southern Italians Playing Bagpipes, to meet his unsuspecting acquaintance. During their meeting Lewis introduced Wilkie to the bodycolor/watercolor technique he had perfected years earlier. Wilkie used this painting method to great effect in Portrait of Sotiri, Dragoman of Mr. Colquhoun. The two works, though visually and technically similar, are profoundly different. Fifty-five years prior to his stay in Constantinople, David Wilkie was born to the third wife of a country priest, in circumstances he would later recall “as low as any lover of humility could desire.”[ii] At the age of twenty while Wilkie enrolled in the Royal academy in London, John Frederick Lewis was born to a family of draughtsman and etchers of limited, but not destitute, means. Wilkie made his name quickly with a series of widely acclaimed genre painting that were marked by an emotional complexity that was informed by influences ranging from acting and Charles Bell’s Anatomy of Expression of Painting to Dutch Painting and the Scottish Enlightenment writer Hugh MacDiarmid[iii]. Elected to the Royal Academy in 1809, he began his career in earnest leaving for tours of Paris and the Low Countries in 1814 and 1816 respectively. Six years later, in 1822, a seminal event was marked for both Wilkie and British painting as a whole with his completion of The Chelsea Pensioners Receiving the London Gazette Extraordinary of Thursday, June 22d 1815, Announcing the Battle of Waterloo!!!. The work most likely inspired Lewis’s initial admiration for the older artist. Commissioned by victorious leader of the battle himself, the Duke of Wellington, the daring re-conception of history painting combined with a genre scene garnered the highest price ever for a contemporary British work of art of 1200 guineas. Attendance for its opening was so high that crush barriers were erected to protect the painting. But lost among the accolades and material success were the difficult issues concerning British identity that the painting contained. By choosing to reveal the victory through soldiers, retired and active, from St. Domingo, India, Ireland, and Scotland in a scene populated by war widows and Jews Wilkie demonstrated the underlining strains to a traditional definition of Britain. Upon the success of the Chelsea Pensioners, Wilkie almost immediately began work on a similar large-scale history painting The Entrance of George IV into Holyrood House (1823-30). He also received, upon the death of Henry Raeburn, his first royal appointment as King’s Limner for Scotland. One year later, Wilkie’s fortunes were decidedly different. The Entrance of George IV had quickly become an unmanageable and ultimately unsuccessful work and the loss of his mother and two brothers with dependent children resulted in Wilkie suffering a nervous breakdown. For the nineteen year-old John Frederick Lewis, 1824 was a time of promise with the beginning of his career in the studio of Painter in Ordinary to King George IV, Sir Thomas Lawrence. While Lewis worked in Lawrence’s studio focusing on animal and sporting pictures, Wilkie sought to regain himself through an extended tour of the continent. Starting in Germany and Italy, in 1826, Wilkie began painting again during his stay in Rome. In late 1827 Wilkie made the highly unusual move of traveling to Spain where he studied, among others, Titian, Velazquez, and later Murillo. The sketches in Spain would serve as the basis for a series of eight paintings made over the next two years that Wilkie submitted to the Academy show in Scotland of 1829, his highest number ever. King George IV bought five of the works ensuring Wilkie’s place in aristocratic patronage from that point on. The triumphal return of Wilkie to the art world also resulted to his second royal appointment, one year later, in 1830, to the post of Painter in Ordinary to King George IV, with the death of Sir Thomas Lawrence. Lewis had begun his first travels on the continent as Wilkie returned from his in 1827. Already a role model to Lewis, and all young painters, Lewis’s return and subsequent visit to Scotland must have been a revelation. Not only had the artist turned his personal tragedy around within two years, but he had also achieved guaranteed financial success, even taking over the studio of Lewis’s first employer. Lewis set out for Spain, as Wilkie had done, traveling and sketching between the years of 1832-34, turning his work into two folios of lithographs, the first dedicated to Wilkie’s patron, the Duke of Wellington, and the second to David Wilkie with “respect and friendship of the author[iv]”, though the exact nature of their relationship is unclear. Shortly thereafter, Lewis attempted, as Wilkie had done in The Chelsea Pensioners, to recast history painting, this time through medium instead of subject. In a series of sketches, Lewis illustrated scenes from the Carlist Wars of succession that followed the death of Ferdinand VII of Spain. Had the series been completed they would have been among the largest watercolors ever executed in Britain. However, Lewis’s initial showing of the sketches were met with a tepid response and he abandoned the project in 1837 to begin an extended tour of the continent making, sketches for paintings of the exotic world outside of Britain. It was during this trip that Lewis made Two Southern Italians Playing Bagpipes (1839-40). Lewis created the drawing using his unique technique of combining graphite, bodycolor, and watercolor as a single medium with the graphite used as primer, the watercolor for tone, and the bodycolor/watercolor for fine detail such as faces and instruments. Depicted are Zampognari, itinerant musicians, who, during the Christmas season serenade images of the Christ child set up at various roadsides. Playing towards the left side of the page, the Zampognari stand at the base of a row of stairs, at the top of which holds an empty red pedestal indicating the moved statue of Christ. The high vanishing point that does not correspond to the view of the figures and slight areas of fill under the standing Zampognari’s chin and between the pipes of his instrument indicate that the figures and setting were probably executed separately. Like all of Lewis’s drawings, the detail is extraordinary, particularly in the instruments. Nearly a dictionary definition of the Italian bagpipes (known as zampognara or cornamusa depending on location) is given with four pipes held in one large stock at the top, two conical chanters, one for each hand, and two crudely bored cylindrical drones. Other details throughout the work are scrupulously recorded from the cloaks to the individual stones. Even areas Lewis fails to complete (like the pilgrim hat and the skin of front bagpipes) are detailed enough that a fully rendered depiction can be extrapolated later on. But within this technical mastery some slight inconsistencies emerge. The ear of the standing figure hangs low and the foot of his kneeling companion is too large. Coupled with the evidence of separate executions for the figures and background, the scene becomes much less an actual event witnessed and more a constructed one tailored for expectations. Zapognari were a familiar subject to Lewis’s British audience, warranting musical allusions in the pastoral symphonies of Handel’s Messiah and Bach’s Christmas Oratorio[v]. Less a rendering of individuals the pair represent a colorful local Italian tradition of exotic interest to the British, like a Tarantella or a carnival celebration. Looking closer the Zampognari’s faces are not so much individuals, as types, their execution showing evidence of an anatomical diagram for their basis belying the idea of portraiture. Portrait of Sotiri, Dragoman of Mr. Colquhoun is similar to Lewis’s Zampognari in that it is also a constructed scene. However, in contrast to Lewis, the scene was made by its own impetus and grew internally within the work rather than being dictated by the imagined demands of an intended audience. Portrait of Sotiri is an unprecedented drawing for Wilkie with its use of the Lewis’s unique technique, employing watercolor, body color, and even oil over pencil on buff paper. The compromised integrity of the paper is due in part to Wilkie’s unfamiliarity with this new method of drawing and to the paper itself, which he had complained of in his journals. Originally a presentation drawing for Mr. Colquhoun, British consul-general at Bucharest and an acquaintance of Wilkie, the work was ultimately abandoned and eventually turned into an exercise of portraiture for the artist. Through Wilkie’s journals and John Nash, his lithographer, an account is provided for all the individuals within the scene. Sotiri, who sits in the center of the page, was an Albanian dragoman (a translator of Arabic, Turkish, or Persian employed in the Middle East) for Mr. Colquhoun. The boy is the son of Mustafa, the Janissary of Mr. Cartwright Consul-General in Constantinople. Wilkie could well have witnessed the interaction pictured here between Sotiri and the boy, as they were apart of the British diplomatic community in and around Constantinople and could have known one another. 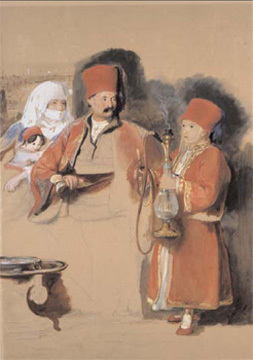 But, a similar drawing by Wilkie, Captain Leigh and his Dragoman (1840), involving like gestures around a hookah demonstrates that the scene was posed. It is hard to say whether this has meaning outside of purely formal concerns, though both include the elaborate illustration of smoke filling the glass chamber of a hookah and the composition may have merely been an excuse to produce an effect the artist liked. The cityscape in the upper left of the drawing depicts the suburbs of Constantinople. To the right of Mustafa’s son there is a suggestion of architecture, possibly a niche or the frame of a window. The cityscape was perhaps originally intended to be a full vista and upon abandoning the drawing as a presentation work Wilkie also gave up on such a complicated background. The inclusion of the woman and child in the far left is a curious addition. Least developed of the portraits (though remarkable in detail), they were mostly likely added last, after the limits of the paper had become apparent. Sources identify her as Wilkie’s Landlady and focus of a later solo portrait, Madame Giuseppina, an unlikely acquaintance to either Sotiri or the boy. Isolated in the foreign city and having lost those dearest to him fourteen years earlier, a lonely Wilkie most likely manufactured a family scene from the people around him. The scene is a good example of the complicated role Wilkie played in orientalist views during the nineteenth century. Like Lewis, and British painting as a whole, the highly detailed costumes and instruments that adorn Sotiri and his companions are a veritable index of local detail. But the attention to individuality within the portraits makes it distinct. Wilkie, while in Constantinople, had painted a small oil sketch of The Tartar Messenger Narrating the News of the Victory of St. Jean d’Acre a painting that would have been one of the first non-Philohellenic, pro-Turkish works in nineteenth-century Britain[vi]. Though cautious and in certain ways contemptuous of Turkish culture, Wilkie saw many affinities between it and his Scottish heritage. The Albanian Sotiri, whose native lands were culturally discrete within the Ottoman Empire, would have served as a parallel for Wilkie’s conception of Scotland, thus making his surrogate family’s ethnic identity all the more poignant. The people of Wilkie’s drawing are trapped in Constantinople, as the artist was trapped in Constantinople during its creation. Unable to be collected and removed for easy consumption the figures, like all great portraits, seem out of place anywhere but in their world. And with their location only slightly finished they seem exceptionally dependent on each other, adding to their unique individual presence. Had Wilkie’s work been fully realized one couldn’t help but think what course the successive years of painting the Middle East might have followed. At the very least there would have been a more humane counter trend. But Wilkie never lived to see his home again, dying at sea in 1841, leaving the Middle East to be depicted by artists such as Lewis. Ironically, Lewis’s work also reflects the character of its creator, with a local custom quickly, albeit beautifully, rendered by a man passing through, collecting all the surface details possible, without gaining the insight that Wilkie sought.